That wasn’t the first iteration of our picnic plan on Sunday last. Marian had the great idea of discovering the location of the North Fork Lunch Truck, and heading to that point for our picnic. Great idea, indeed. We learned the truck was at McCall’s Vineyard, one of our favorites. 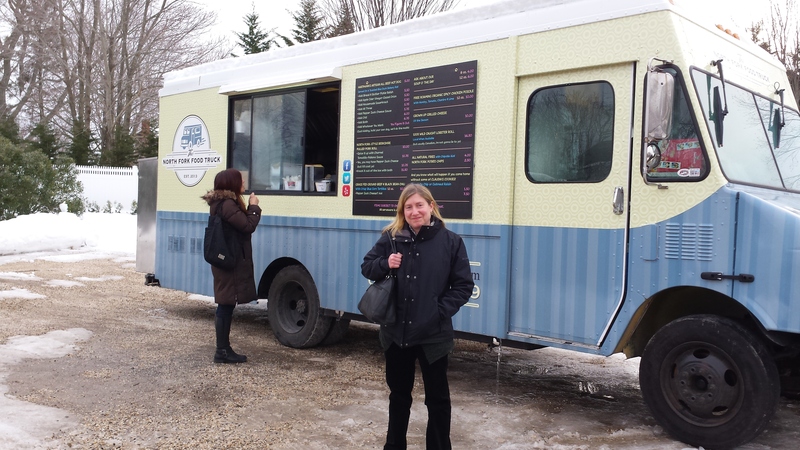 We told you about the lunch truck when it visited Bedell’s, during the LI Winterfest. We shared one of our McCall’s visits as Summer 2013 drew to a close. We love the truck and McCall’s, so it appeared the stars were aligning. Nope, it was not to be. The Generator Gods didn’t favor our cause, and sadly, the truck was off line. There were loads of people enjoying the McCall’s venue, consuming plenty of wine. One happy group confessed their disappointment in truck-failure. For that crew, the wine was excellent compensation. The truck decamped as we did, and we headed back to Mattituck to get something to eat. I had prepared some neat salads, including an Alice Waters recipe for a lentil salad, a Food and Wine recipe for a sour cream slaw, and a cucumber and red onion salsa. Oops, no sandwich in the cooler, so we visited the Village Cheese Shop to pick up a couple of sandwiches. A Pate and a Ham n’ Cheese walked out the door, and we wondered where to eat. 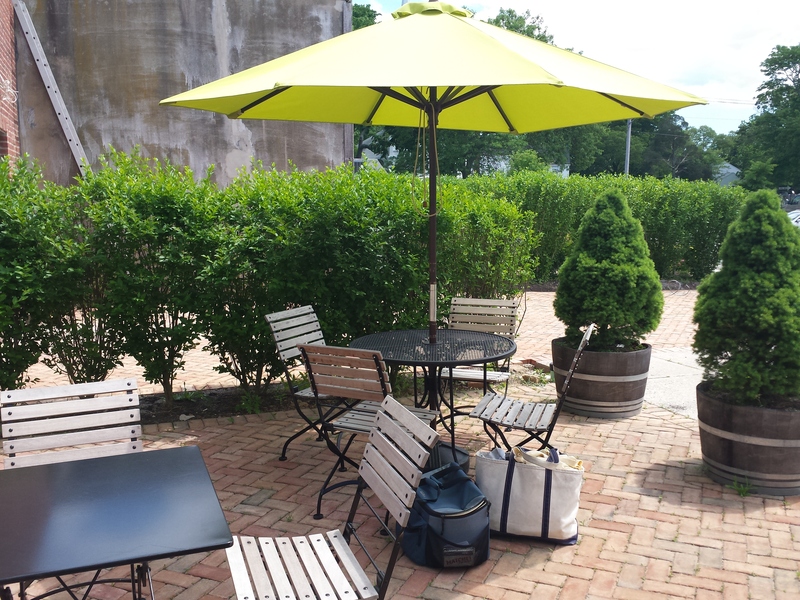 Marian noticed that the Roanoke Vineyards Tasting Room had a small picnic area in a small but elegant back yard. Suddenly, things were looking up. We had the good fortune to meet Robin Epperson-McCarthy, who was running the tasting room that afternoon. 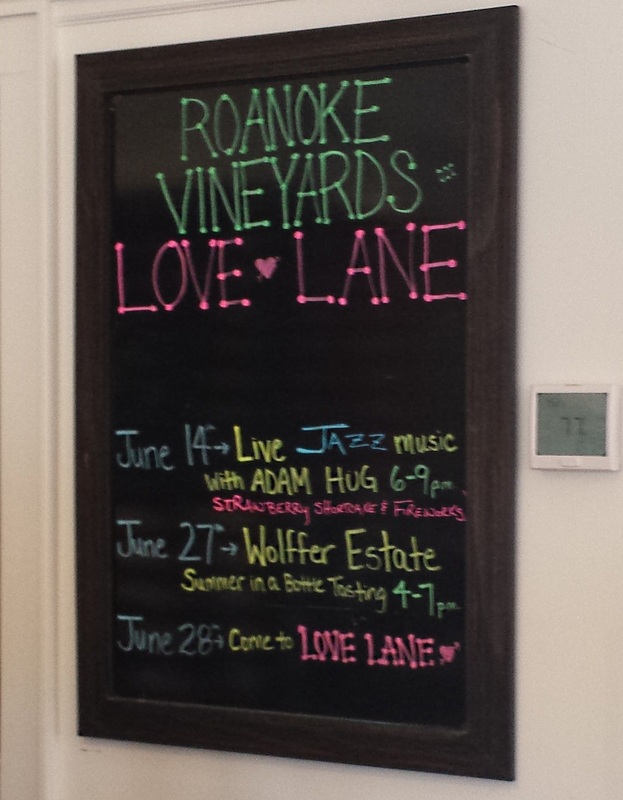 A sommelier, winemaker, and director of education for Roanoke Vineyards, Robin is a wine jewel, who knows her craft and is an engaging foodie, as well. What a treat! On Robin’s recommendation, we tasted their full-bodied 2013 DeRosa Rosé , a product of Roman Roth’s talented wine making. 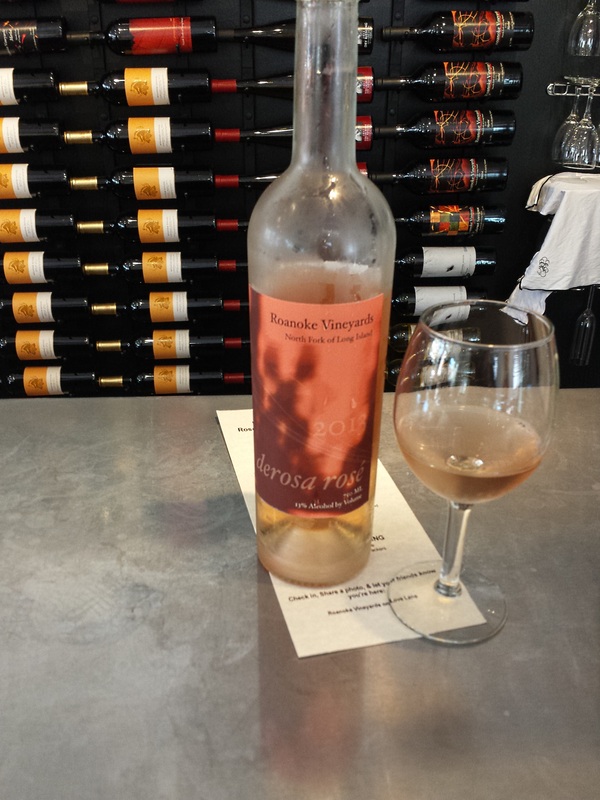 One of several rose choices, this wine was perfect for our picnic lunch. At $18.00 / bottle, it doesn’t hurt the pocketbook either. In case the Village Cheese Shop is out of sandwiches, the tasting room has a good supply of cheese and pate. Delicious, and perfect for a heart-healthy lunch. Remember that the French don’t suffer from heart disease as we do. It must be the wine. Relaxing in the shade of our umbrella, enjoying food and wine, and chatting with Robin, made this a perfect picnic afternoon. Don’t worry, Rosé is not your only choice. Note the view from the tasting room. It’s my kind of wallpaper. The food, wine, and conversation finished, we eventually headed for the Magic Fountain. Yes, we told you about this great ice cream last week. This time, we enjoyed butter pecan and chocolate brownie (again). Was it great? Yes! With a couple of iced coffees from the nearby Starbucks’s, the food-fest was over. For the time being, anyway. I’ll tell you about a fabulous steamed clams dinner another time. The clams were from Braun’s Seafood, and the dish was terrific! 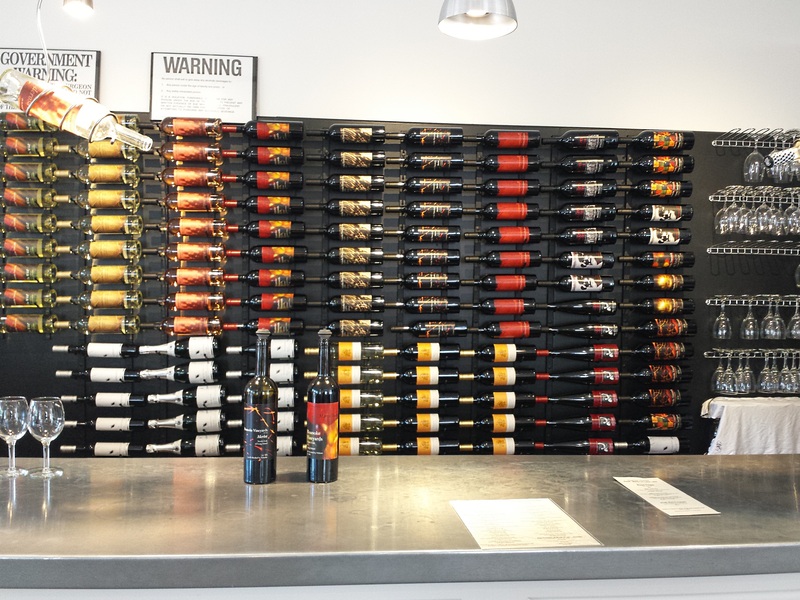 The June 2014 Mega-Tasting is scheduled for Saturday, June 14, at Osteria Salina in Bridgehampton, NY . We will be there for our favorite kind of “show and tell”. Stay tuned, and enjoy your trip around town.